Broadly speaking, religious motivations are the primary draw for Jordanian volunteers in Syria. Raad Adayleh/AP/Press Association Images. All rights reserved.In the light of the June attacks in Jordan, the Hashemite Kingdom has closed its borders with Syria and continues to imprison its nationals for terrorism-related charges. Jordan has already taken steps to limit the threat from extremists, but without fully understanding the many reasons why these men have traveled to Syria, effective counter-radicalization and de-radicalization will not be possible. Furthermore, understanding why Jordanians fight in Syria sheds light on possible motivations for European foreign fighters. Each individual has unique circumstances and beliefs that drew them to Syria. However, the following is a breakdown of the major motivations, determined through independent research and expert interviews, that have played some role for many of Jordan's volunteers. These motivations were determined through analyses of news reports, scholarly works, and interviews I conducted in Jordan with Salafi experts and activists. Broadly speaking, religious motivations are the primary draw for Jordanian volunteers in Syria. This can be broken down into its component parts: generally, for the youth, the desire to create an Islamic State is a prevailing factor. Concurrent to this desire is the influence of the legacy of Abu Musab al-Zarqawi among the most extreme Salafi Jihadists in Jordan and especially among the youth. For the older generation of Salafi Jihadists, implementing sharia law to various degrees is more important than the immediate creation of an Islamic State. However not every Jordanian Salafist has an interest in entering Syria. The term 'Salafist' describes a wide range of political and religious beliefs, each with its own sheikh, or leader. Many Salafists traveled after their specific religious sheikh issued a fatwa legitimizing jihad in Syria. 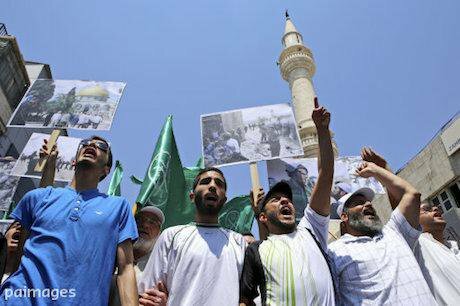 The initial wave from Irbid in late 2012 and early 2013 was comprised largely of the followers of Sheikh al-Tahawi, whose February 2012 fatwa called for Jordanians to fight in Syria while invoking the legacy of Zarqawi as the protector of Sunnis. Likewise, many of the volunteers from Ma'an are followers of the radical preacher Abu Sayyaf. The wide array of Islamist groups fighting in Syria allows for movement between groups as identities and allegiances shift. Each Salafist is likely to have a corresponding group that espouses their ideology or one similar to it. According to Salafist expert Dr Mohammad Abu Rumman, this has led some reform Salafists, i.e. Muslim Brotherhood supporters, who had no history of violent Salafist activities, to join Jabhat al-Nusra, one of the few organizations willing to accept non-Syrians. Yet Jabhat al-Nusra has only just severed its ties to al-Qaeda and Zawahiri, enabling it to also draw volunteers from Jordan's older, al-Qaeda-affiliated Salafists. These shifting allegiances came into effect again when, according to Salafi activist Marwan Shahadeh, many of Jabhat al-Nusra’s more hardline members deserted and joined IS after al-Baghdadi announced the establishment of his Islamic State on 29 June 2014. For everyone, the sectarian nature of the conflict and the desire to protect fellow Sunnis is one of the most compelling motivations, if not the most compelling. It is driven by perceived kinship, whether ethnic or religious, as identified in Cerwyn Moore’s theory of fictive kinship. According to Marwan Shahadeh, some Jordanian Palestinians are enticed by the desire to fight for Palestine and join other Palestinians in Syria. Jordan's settled tribesmen who have volunteered have undergone a process in which their tribal identity was surpassed by their newly adopted religious identity. Thus, the classic social constructs of Jordan’s tribes, where the importance of religion and the broader Arab community come after the family, clan, and sheikh, cease to hold the same weight as among nomadic and semi-nomadic communities. This has enabled these volunteers to shift their loyalty from their tribal sheikh, none of whom have called for jihad in Syria, to a Salafi Jihadist sheikh, such as Abu Sayyaf, who has issued fatwas on Syria. Parallel to the desire to protect fellow Sunnis is the more general desire to fight Assad and end his regime’s atrocities. However, while this is an underlying factor that surely assisted in pushing most volunteers to travel, it is probably not the final factor upon which the decision was made. At a more tertiary level, economic incentives may have served to push some wavering volunteers over the edge but cannot be ascribed as a catch-all motivation, given the high proportion of college degrees among the volunteers and the fact that many were also working in well-paid jobs. 1) The ease of entering Syria. According to Dr Abu Rumman, a young Jordanian who was not being monitored by the General Intelligence Directorate could easily board a flight from Amman to Turkey and cross the border there, and there were plenty of access points along Jordan's northern border for the older generation of Salafi Jihadists who had more difficulty moving freely under the watchful eye of the GID. 2) Recruiters target groups, not individuals. A Jordanian who meets the above prerequisites and who has friends or family who have gone or are planning on going is more at risk of volunteering in Syria. This list is by no means exhaustive. One broad theory cannot encapsulate every personal reason why these men and women have left Jordan for Syria. And while the hierarchy presented here may be unique to Jordan, these motivations exist to some degree across the world. But if measures are taken to understand the fundamental motivations behind the mass mobilization of Jordanian volunteers, it may be possible for effective counter-radicalization and de-radicalization measures to be taken both in Jordan and the west. It is hoped that Jordan’s strong state security apparatus combined with support from the United States will allow the kingdom to weather the fallout of the Syrian Civil War.